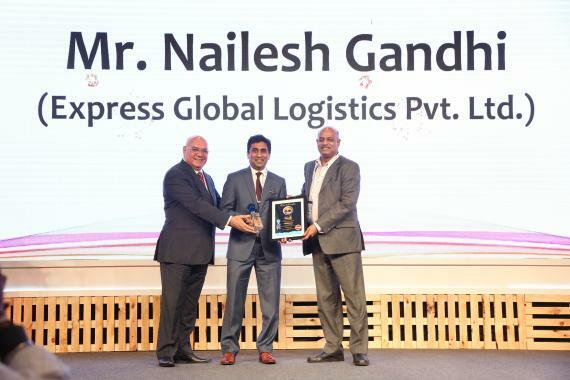 Mr. Nailesh Gandhi, Director of Express Global Logistics (members in India), has been awarded as 'Dynamic Logistics Professional of the Year' at the 2018 All India Maritime and Logistics Awards (MALA). The MALA awards are one of the industry's top honours in India and Nailesh was awarded at the ceremony held on 31st August in Mumbai. The award is a testament to Nailesh's immense knowledge and contribution to the Indian logistics sector. "As a market leader, EXG has made significant contribution to the project logistics industry by going beyond the standard mandates which is conductive for the growth of the sector. They stand for performance, service and safety, regardless of the complexity or extent of logistics tasks and requirements. EXG is well equipped for any and all challenges thanks to our robust business model." "MALA has emerged as an authoritative recognition of quality service, best practices and innovation, both among companies and individuals, in the various segments of the maritime and logistics sector. Selected by a jury comprising of some of the leading lights of the industry, it can truly be said that this is an award of the sector, by the sector and for the sector, which has made this achievement for EXG all the more noteworthy."